The numbers are remarkable. So far in 2018 the Outer Banks Community Foundation has awarded $147,500 in scholarships to 72 local students. And a number of those scholarships are renewable, bringing the total amount awarded to Outer Banks students to almost $220,000. But those are just numbers, and although they tell a remarkable story of a caring community that believes in supporting the hopes and aspirations of students, it doesn’t tell the full tale of what it means to know that achieving a dream is one very tangible step closer. 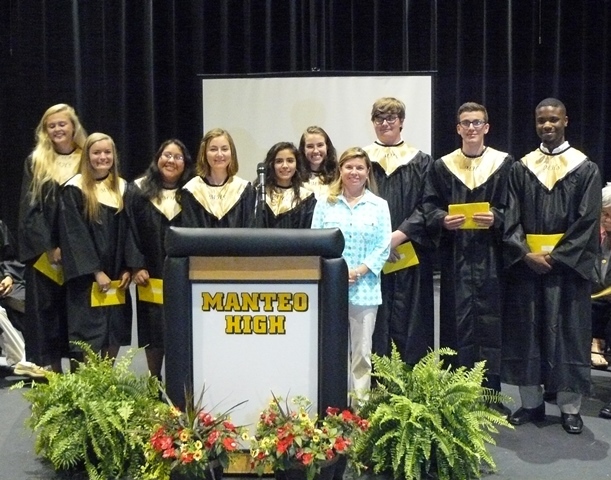 Manteo High School graduate Vanessa Salazar was awarded the Jerry and Arlene Davis Scholarship, a $6,000 renewable scholarship that will help her to begin her studies in nursing at Appalachian State. The Davises, recognizing that college is becoming more expensive, increased the grant this year from $5,000 annually to $6,000. Salazar has already identified what she hopes to do with her nursing skills. “When I was in the Interact Club, we visited a special needs program. It opened my sight to special needs nursing,” she said. It is a tribute to Dare County schools that through their studies, many students are able to recognize what they are hoping will be their careers. The Milton Jewell Academic Scholarship is a $6,000 renewable scholarship that is awarded to one Dare County graduating senior every year. The qualifications include high academic achievement, exceptional school and community involvement, and proven leadership. This year’s recipient, Manteo High School Valedictorian Elizabeth Wheless, exceeded all of the requirements, and is off to UNC Chapel Hill in the fall to major in media and journalism. “Last year I realized I wanted to work in journalism when we were creating an edition (of Sound to Sea, the MHS school paper). Working on the stories and the editing, I knew it was what I wanted to do,” she said. The desire to give back to the community seems to be an important theme with the 2018 students who were awarded scholarships. The R. Stewart Couch Hatteras Island Scholarship was established through a bequest from Stewart Couch, a Hatteras Island native who built Hatteras Realty from a small real estate firm to a nationally recognized property management company. It is, perhaps, fitting that Kayleeann Jones, the 2018 recipient of the $8,400 scholarship, dreams of coming back to the Outer Banks one day to own her own business. The scholarships seem to be a validation of the dreams of the students, but there is also the very real understanding of the financial burden of a higher education. Although helping with the cost of college was important, the sense of pride in the achievement and love of their parents are also memories the students will cherish. “When they told me I would be getting the scholarship, my parents hugged me and told me they were incredibly proud of me,” Wheless said. For Salazar, an AVID student who will be the first in her family to attend college, her accomplishment is also a source of family pride, something that was evident at the scholarship award ceremony.